Suitable for slitting rewinding paper, film, adhesive tape such as BOPP, PE, PET, masking tape, double sided tape, self adhesive material, release paper, etc. 1. The motor unit adopts three-motor connective control with high speed, stable tension and nice looking products. 2. It’s equipped with tension detecting device with PLC auto constant tension control system. 3. 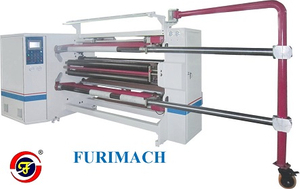 The rewind press roller system adopts combined device of discontinuous movement and air pressure auxiliary control to ensure minimum distance between press roller and products, and also to ensure different materials converting. 4. The rewind system can be changed easily from air shaft to differential shaft. 5. It’s equipped with infrared ray auxiliary paper core position device to save time. 6. It’s equipped with finished products fast unloading device. 7. Waste collect system can choose left-right moveable surface rewinding type, servo motor control center rewind type and blower fan collect type. 8. Slitting blade can use air blade, shear blade, razor blade for different material slitting. 9. The unwind system has EPC/LPC device, hydraulic type jumbo roll uplifting device and material receiving platform. 10. The unwind system can choose shaft/shaftless connect type, shaft/shaftless separate system.